Since our housewarming party 3 years ago when mounds of bumblebees were invading our lunch buffet, and someone pointed out that St Rita is often represented by bumblebees, we knew it was only fitting to name our dining room The Rita Room - in its very early stages of renovation, it was vibrantly dark shade of red, with a gold ceiling, and bumblebee curtain valences. 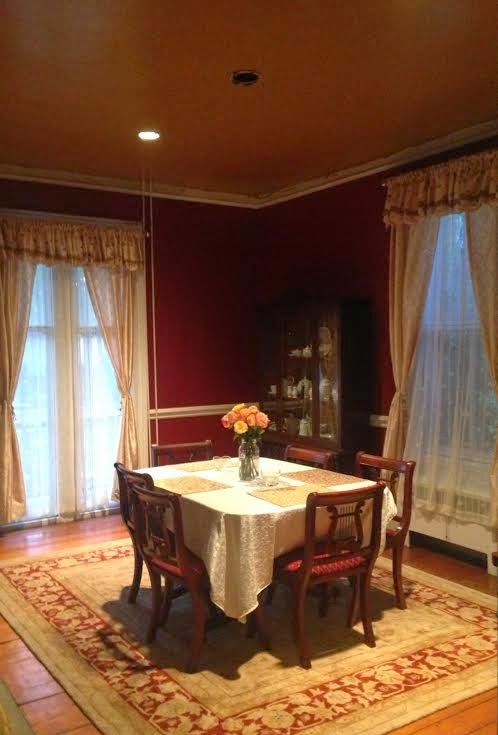 We removed the moulding (it wasn't crown moulding, but just a ledge with white painted above it to give the illusion of crown moulding) and I also moved the curtains up on that window to the left. It bugged me to have the windowsill showing above the curtains, even though at the time I hung them I was hell-bent on having floor-length curtains, which unfortunately Country Curtains doesn't make in this pattern :( Anyway, now the windowsill is covered, AND both sets of curtains go to the baseboard, so it's a good compromise. And to finish the room, I need only 2 things. One, a wallpaper border for the top of the wall (where the gold paint is messily showing right now, but will eventually be covered up. I found this gem at Walmart, of all places! I ordered one to see if the red will clash or not, first. I really hope it works, this will be perfect! But, obviously these are two very different chandeliers. So the question becomes, what kind of feeling do I want in the room? With 8' windows and 10' ceilings, I definitely want the light fixture to make a statement... but I'm not sure what statement I want to make? 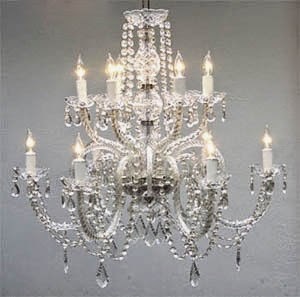 I can always do crystal chandeliers elsewhere, small ones in hallways, bathrooms, bedrooms, whatever (not all of those places, I'm not a Swarovsky hoarder), if I choose not to do crystal in the dining room. But I don't want to regret not getting crystal. Interestingly, the top picture is the (much) more expensive chandelier. I also need a 32-36" width, ideally. Can I put this to a vote? 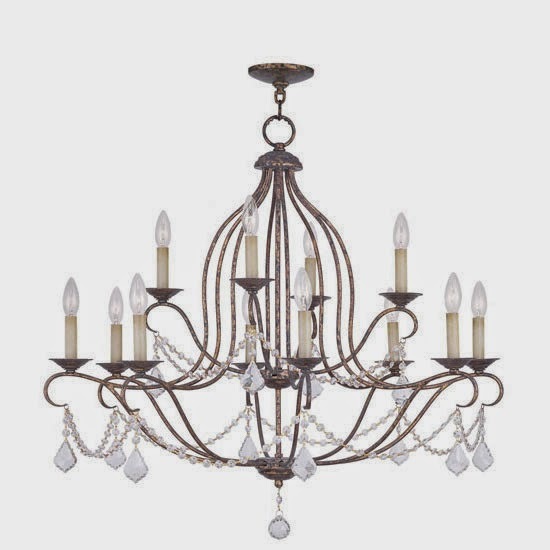 Which chandelier to finish the Rita Room? OR, if you feel so inclined, go ahead and find me something EVEN BETTER than these two options! I'd love you forever! What a gorgeous room, and an awesome idea. I must say I love the second one--go big or go home :) Happy Feast Day! I vote for Chandelier #1 If you are the one who has to clean it. #2 is lovely, but from experience a Bear to clean! I like the one with more crystals. Seems to fit with the room more to me. Wait, was that a challenge? First of all, more crystals are better. 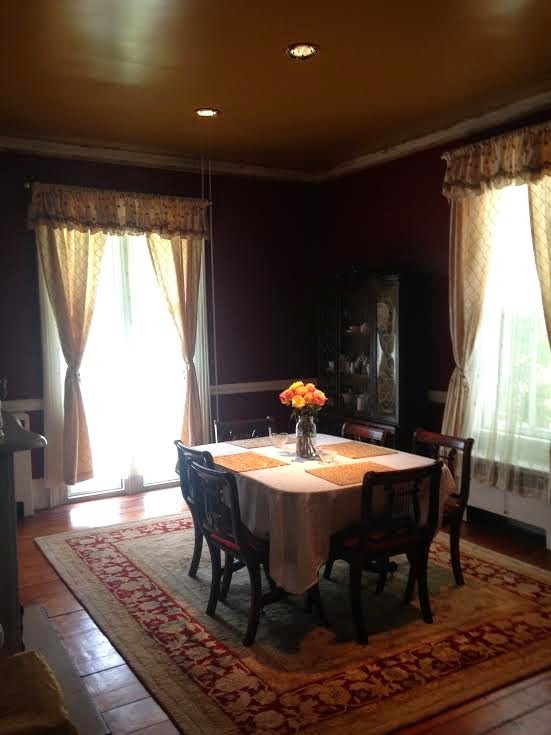 At least in a formal dining room in an old house. Second, that's gorgeous work and I extra-especially love the bee curtains. 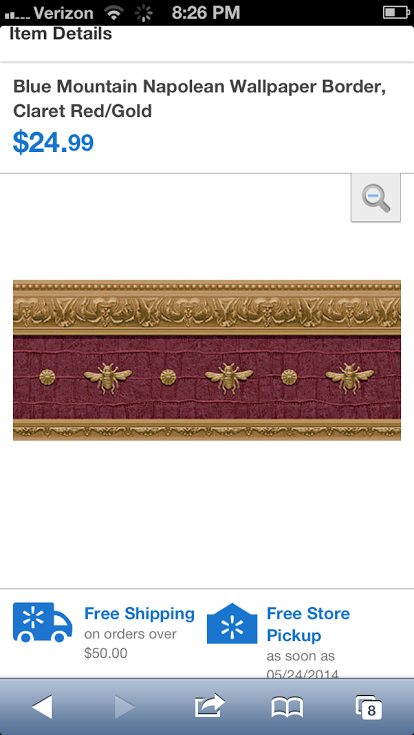 Also blown away by the Wal-Mart sourcing on that wallpaper border. Now, on to chandeliers specifically. This is half off retail but may be too small: http://cnj.craigslist.org/hsh/4437099662.html. Not sure how big this is: http://cnj.craigslist.org/hsh/4475192132.html. This one is surprisingly attractive given its age: http://cnj.craigslist.org/for/4428795586.html. This one has the crystal arranged a different way: http://cnj.craigslist.org/fuo/4426697564.html. And now I need this: http://cnj.craigslist.org/hsh/4407039854.html. Except I don't live there. How did this happen? I'm not done (you knew that). Prepare for a steady influx of chandeliers. Hmmm I like the 1st one which is more my taste and the fact that it's easier to clean. But really don't listen to me because I was going to suggest that misfit would take this challenge and find you the perfect one :) I love the bee curtains and what an awesome walmart find! Fun!!!! I'm not great at decorating, but I like the first chandelier better. I tend towards simple pieces, so I think that's why I like one better. I prefer the first one, the second would be a PITA to dust! I love how The Rita Room got its name!!! I love the first one - the color and style fits more, for me. I'm excited to see what you pick! Do share!!! Like them both, voting for two, but it was a close race. Just curious - what lighting did you decide upon?